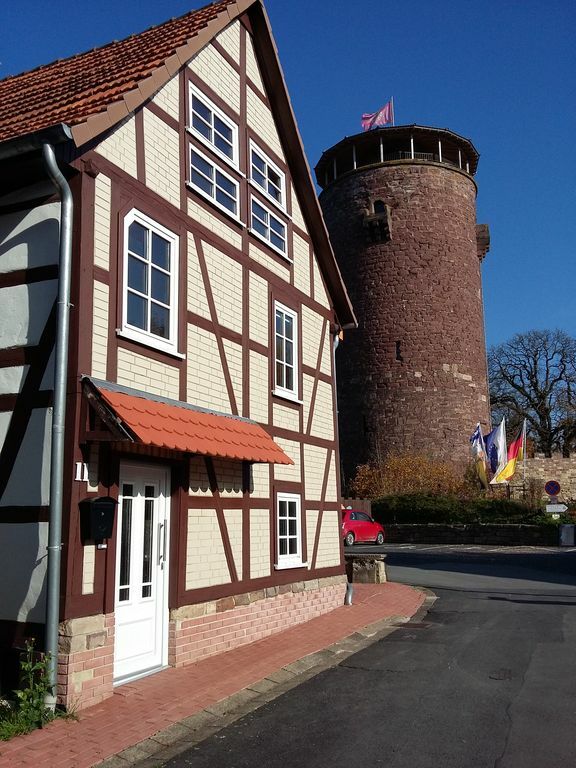 Historic half-timbered house with modern facilities. Direct view of the castle. Experience the Middle Ages with modern comfort in our newly renovated half-timbered house completed in May 2016. The kitchen is equipped with ceramic hob, oven, dishwasher, microwave, refrigerator with freezer, coffee machine, toaster, Senseo and water cooker. Crockery and dishwashers are provided. The dining room with its large wooden table invites to the cozy food and linger. In the guest WC there is a washing machine. In the first bedroom there are two beds. It is equipped with blackout blinds. Bed linen is provided. Also the second bedroom is equipped with blackout blinds. Sleeping for two people is provided by a 1.40 m wide bed. The shower bath is also equipped with a large bathtub, which invites you to relax after long walks. Towels and hairdryer are available. In the whole attic is the living room. There is a TV, a stereo and a reading corner. The sofas are sofa couches, the additional persons offer a sleeping place. The living room is equipped with blackout blinds. From the living room you have access to the large balcony, where you can enjoy the direct view of the Trendelburg. There is also a terrace with a view of the castle. There is underfloor heating throughout the house. Individual requests, for example, bread service or shopping service before arrival, gladly accepted. An excelent place to stay. We had a great two weeks in Trendelburg. The house is very clean and well maintained and had everything we needed. Andrea and Michael made us very welcome on our arrival. It was very quiet and peaceful in the village with good food at Gasthof Bradner. There is a good view over to Rapunzel's Tower from the balcony which was a great place to sit in the evenings and enjoy a glass of wine.. Wonderful, Magical and Very Comfortable. A very comfortable and attractive property which was extremely well appointed and had everything you could wish for, including a balcony which directly overlooked the magical Rapunzel Tower of Trendelburg! Accommodation is on three levels, with the Kitchen & Dining area on ground level, including a toilet/utility room with a washing machine. A wonderful wooden spiral staircase tales you to the first floor where two bedrooms and the main bathroom with shower and bath are located. Continue up the spiral staircase to the second floor to where you find a large spacious living room with TV and music centre. Also access to the rooftop balcony overlooking the Burg Hotel and Tower as well as Trendelburg itself. Street parking and outdoor barbecue also available to the front and side of the property. Property owners Michael and Andrea were lovely, very helpful people who greeted us on arrival and came to say goodbye at the end of our stay. Highly recommended 5 Star property which we would be delighted to stay in again! Über Silvester verbrachten wir mit unseren Töchtern (4 und 8) sehr entspannte Tage in Trendelburg und Umgebung. Wir haben uns im Haus rundum wohl gefühlt und trotz mäßigem Wetter schöne Ausflüge unternommen. Die Region hat einiges zu bieten und die liebevolle Gestaltung der Räume schafft eine besondere Behaglichkeit. Die Gastfreundlichkeit der Vermieter ist kaum zu übertreffen: Selbst der Sekt stand bei unserer Ankunft schon parat! Insgesamt erlebten wir die Tage wie eine Zeitreise und konnten den Alltag hinter uns lassen. Sehr schönes Ferienhaus in perfekter Lage mit Blick zur Trendelburg. Alles bestens. Sehr freundliche Vermieter. Wir haben unseren Urlaub im Haus Froschkönig sehr genossen. Bei der Ausstattung fehlt es an nichts. Das Haus ist sehr geschmackvoll eingerichtet und sehr sauber. Unsere Kinder hatten viel Spaß beim Zählen der Frösche :) Sehr empfehlenswert. 5 Sterne. Trendelburg lies on the German Fairytale Route and is surrounded by beautiful countryside. The Reinhardswald and Diemeltal for hiking. In the resort there is the possibility to borrow canoes to explore the Diemel in this way. The Trendelburg Castle is a stone's throw away from the house and invites you to good food and to linger. Nearby there is a bakery that can sweeten your stay with lots of goodies. A shopping and beverage market are within walking distance. The town has a dental practice, family doctors, pharmacy, hairdressers, several restaurants and an outdoor pool. Unsere Preise verstehen sich für 1-4 Personen, inklusive Bettwäsche, Handtücher und Geschirrtücher. Es besteht die Möglichkeit zwei zusätzlichen Personen eine Schlafmöglichkeit auf den Schlafcouches zu bieten. Hierfür berechnen wir pro Person zusätzlich 15 € pro Übernachtung. Langzeitaufenthalte sind auf Anfrage möglich. Individuelle Wünsche, beispielsweise Brötchenservice oder Einkaufsservice vor Anreise, werden gerne entgegen genommen. Das Rauchen und Feuer jeglicher Art ist innerhalb des Gebäudes nicht gestattet. Der abgebildete Kamin ist nicht für den Gebrauch bestimmt. Die Haltung von Haustieren ist nicht gestattet.